Following a few scattered independent releases, done mostly on homemade CDs with hand-drawn art, VanGaalen released Infiniheart (2004) on Canadian independent label Flemish Eye. Infiniheart, a collection of songs selected from recordings made in his bedroom/makeshift studio, was picked up in 2005 by indie label Sub Pop. In late 2005, the album was re-released with a bonus six-song EP entitled Green Beans. On 22 August 2006, VanGaalen's second album, Skelliconnection, was released in the U.S. on Sub Pop and in Canada on Flemish Eye. The album is composed of new songs as well as tracks previously released on his earlier independent recordings and features exclusive artwork and videos made by VanGaalen. ChartAttack reported on 17 January 2007 that Skelliconnection was #31 and had been on the chart for 19 weeks. Skelliconnection was named to shortlist on 10 July 2007 for the 2007 Polaris Music Prize. The winner was announced at a gala ceremony on 24 September 2007, with the prize going to the band Patrick Watson. VanGaalen's third studio album, Soft Airplane, was released 9 September 2008. Soft Airplane marked a significant change for Vangaalen's songwriting as, unlike previous Vangaalen releases (where songs were collected from a vast catalogue of previous home recordings), Soft Airplane was written within the two year time span since Skelliconnection. Soft Airplane garnered many favourable reviews internationally. It was both nominated for a Canadian Juno Award for Alternative Album of the Year and shortlisted for the 2009 Polaris Music Prize. Furthermore, the album maintained a #2 placement in Exclaim! 's Top Albums of 2008 and, upon release, spent 22 weeks on !earshot's Top 50. Vangaalen toured Soft Airplane extensively; performing live dates throughout North America, Europe, and the UK throughout 2008 and 2009. Vangaalen opted to tour with Flemish Eye label mates Women for many of his performances allowing him to utilize certain bandmembers as his backing band. In September 2009, to celebrate the success of Soft Airplane, Vangaalen released an accessory EP for free download. VanGaalen's song "Rabid Bits of Time", off of Soft Airplane, was featured in the trailer for the 2011 indie film Norman. On 11 August 2009, VanGaalen released a full-length album Snow Blindness is Crystal Antz under the alias Black Mold. The album features the organic instrumental and electronica-oriented sound merely hinted at on his other releases. Snow Blindness is Crystal Antz was released with a download code to 100 plus minutes of glitchy odds and ends, unfinished ideas, analogue improvisation, and experimental manipulation. VanGaalen is sometimes assisted live by bass player Mathew Flegel of the indie rock band Women and drummer Eric Hamelin from No More Shapes. Also, occasionally by Monty Munro. In 2008 VanGaalen recorded the debut album of Women as well as their second album. VanGaalen is also an illustrator and animator, and has made his own album artwork and animated music videos to accompany several of his songs, including "Clinically Dead", "Flower Gardens", "Red Hot Drops", and "Molten Light", as well as the Love as Laughter song "Dirty Lives" and Timber Timbre's song "Beat the Drum Slowly". He won the Prism Prize in 2015 for "Beat the Drum Slowly", alongside a second nomination for the video for his own single "Monster". He has also designed album covers for other artists, including Shout Out Out Out Out's Not Saying/Just Saying. In 2015, VanGaalen collaborated with Seth Smith of the indie rock band Dog Day on the album Seed of Dorzon. ^ Wilson, MacKenzie. 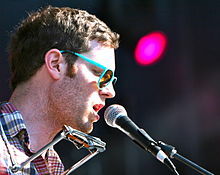 "Chad VanGaalen Biography". allmusic.com. Allmusic. Retrieved 2 December 2011. ^ "Chad VanGaalen Artist Page". radio3.cbc.ca. CBC Radio 3. Retrieved 2 December 2011. ^ Ciabattoni, Steve. "Chan VanGaalen: Heart of Gold". College Music Journal. Archived from the original on 27 September 2007. Retrieved 16 February 2015. ^ Brown, Marisa. "Skelliconnection Review". allmusic.com. Allmusic. Retrieved 23 January 2007. ^ Burland, Chris (17 January 2007). "Tom Waits Still Has What It Takes". Chart. Toronto: Chart Communications. chartattack.com. ISSN 1198-7235. Archived from the original on 7 June 2011. Retrieved 24 January 2007. ^ "CBC News » Arts & Entertainment » Arcade Fire, Feist on Polaris short list", collectionscanada.gc.ca, Toronto: CBC News, 10 July 2007, retrieved 10 July 2007. ^ Love, Noah (10 July 2007). "Arcade Fire, Feist And The Dears Among Polaris Nominees". Chart. Toronto: Chart Communications. chartattack.com. ISSN 1198-7235. Archived from the original on 21 December 2008. Retrieved 24 April 2009. ^ Thiessen, Brock (September 2008). "Chad VanGaalen » Home Alone » Features » On the Cover » Sep 2008". Exclaim!. Toronto: 1059434 Ontario Inc. www.exclaim.ca. ISSN 1207-6600. Retrieved 2 December 2011. ^ Love, Josh (28 August 2006). "Chad VanGaalen - Skelliconnection - Review". Stylus Magazine. Archived from the original on 12 November 2006. Retrieved 23 January 2007. ^ "Chad VanGaalen Wins 2015 Prism Prize for Timber Timbre Video". Exclaim!, March 29, 2015. ^ Jason Anderson, "Solo 2.0: Ingenious young musicians are redefining the one-man band". cbc.ca, 30 October 2006. ^ "Chad VanGaalen and Seth Smith Make "Experimental Techno" on 'Seed of Dorzon'". Exclaim!, September 2, 2015.